About a year an a half ago I was right in the middle of researching data warehouse technologies and starting to get quite discouraged on the lack of good technical books on the topic. Then I came across the book “Oracle9iR2 Data Warehousing” by Hobbs, Hillson and Lawande. Here’s the review I put on Amazon on this deep technical book. 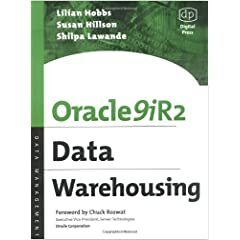 In this book, the authors take you swiftly and thoroughly through the entire process of creating a data warehouse. Several other books (I purchased 4 others before this) over-generalize the topic, teaching the vocabulary and business reasons for data warehousing. This book teaches how to implement a warehouse in Oracle 9i Revision 2, while teaching the major concepts through practical application. It would be easy to get bogged down in the technical details of this book if one were not familiar with the Oracle environment. Those who are familiar with Oracle will find it is much like the courses offered by Oracle. The book consistently, clearly presents the concepts (dimensions, fact tables, summaries, ETL) then delves into such depth it leaves the reader with a complete understanding of not only how to implement each concept, but when, and why to implement them. The major concepts covered include dimensional modeling, data partitioning, query optimization, materialized views, dimensions, the extract-transform-load process, warehousing tools, ongoing warehouse maintenance, and many more. Furthermore, SQL for the examples used in the book are available from one of the authors websites, affording the reader a hands-on environment in which to observe these concepts. Overall, I would recommend this book to anyone looking to work with warehousing who already has a firm Oracle background (strong knowledge of schemas, data dictionary, storage conventions, terminology.) This is simply the best book I have found on data warehousing. I see that there is now a new version of this book out. “Oracle Database 10g Data Warehousing” by the same authors, plus Pete Smith, will go on my short list for tech books to buy. Well, the coffee has been ground and is just about done brewing. Soon it will be ready to be consumed… again. AnimalCoffee.com specializes in this rarest of all coffee and was nice enough to send me a sample since I’d never tried it. The out-of-the-box experience on this coffee is unbelievable. It shipped from Indonesia packed in bubble wrap, cardboard, then paper. 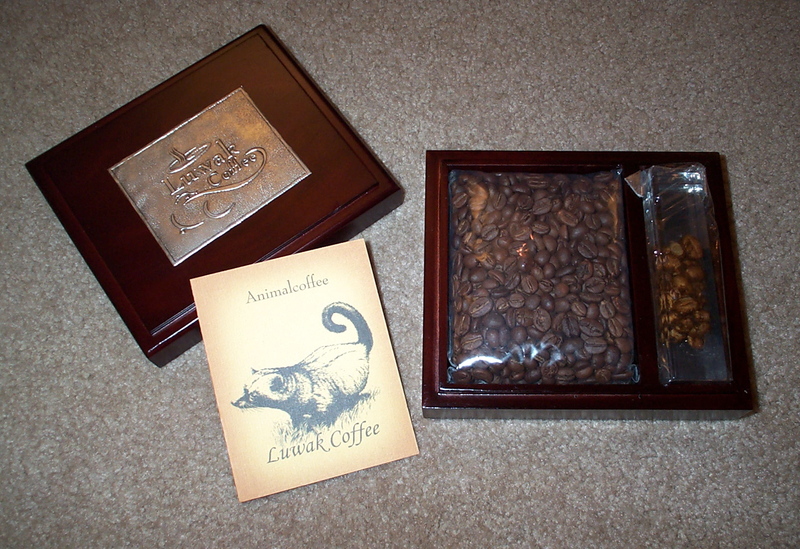 The entire package (as pictured here, click on the thumb for a larger image) comes in a sharp looking wooden box with a Luwak Coffee plaque, a lucite paperweight, a card describing the Luwak Coffee process, and a package of the coffee. The whole experience tells me I’m about to try something very exclusive. The smell of the bean was earthier than other coffees. There’s a complexity to it which I hope is an indication of how it will taste in the cup. Well, the coffee is brewed and it’s tasting time. I’m trying it with half-and-half and sugar. The flavor is strong and complex, but without the bitterness usually associated with coffees that are this rich. There is a pleasant earthy flavor I cannot quite place. I can honestly say it stands apart from every other coffee I’ve ever had. The bouquet has a lot to do with the flavor of this coffee. While I’m at a loss to describe it, it is very plesant and quite unusual. I’m trying it black now, and even in the absence of sugar there is not even a hint of bitterness. The aftertaste dissipates quickly much like a pure Hawaiian Kona. It’s a smooth finish with a slight nuttiness to it. The perfect finish to the perfect cup. Both with cream and sugar, as well as black this is an outstanding cup of coffee. This is one of the best, most unique coffees I’ve ever had. If you or someone you know are the type of person who seeks out the best coffee in town, have tried dozens of mail-order coffees and are always on the lookout for something unique, AnimalCoffee.com has just the treat for you. With the steep price this will no doubt remain a rare treat, but with gift boxes starting at $20 this is the ultimate coffee gift. With a great presentation, outstanding flavor, and bragging rights for trying the rarest and most expensive coffee in the world it’s the perfect gift for the coffee connoisseur. If you don’t want to spend the $100+ per pound for coffee for your office you should get a quote on coffee service from www.coffeeforless.com! Get your office coffee delivered right to your office!